I analyze data for a living. First @CarnegieEndow, then @Yammer and @Microsoft, now @ModeAnalytics. The world is full of interesting datasets. But even though data is increasingly accessible, it’s sometimes hard think up an interesting problem to analyze. Maybe there are just too many possible questions, maybe it’s a pain to set up analytical tools, or maybe it’s just too easy to get distracted by animal GIFs. Are the Playoffs Taking Forever? We’re over ten days into this year’s NBA playoffs, and several of the opening series have made it all the way to…Game 5. The NHL playoffs, which are entering their third week but only the second round, are also in no apparent hurry. So far, this year’s exciting playoffs are keeping critics quiet. But if tight overtime games and buzzer beaters give way to blowouts and snoozers, the annual complaints about the length of the NBA and NHL playoffs will probably resurface. So I decided to take a detailed look. Sure, the playoffs feel long, but are they really? We’re less than two weeks into the 2014 baseball season, and most people would say that it’s too early to make any forecasts about the rest of the year. Still, as others have noted, though ten games only represents 6% of an MLB season, surely these early games provide some indication of how a team will finish. Does Milwaukee’s 7-2 start mean that they may not be the sub-.500 team they were predicted to be? Are the 4-8 Diamondbacks likely to even worse than expected? 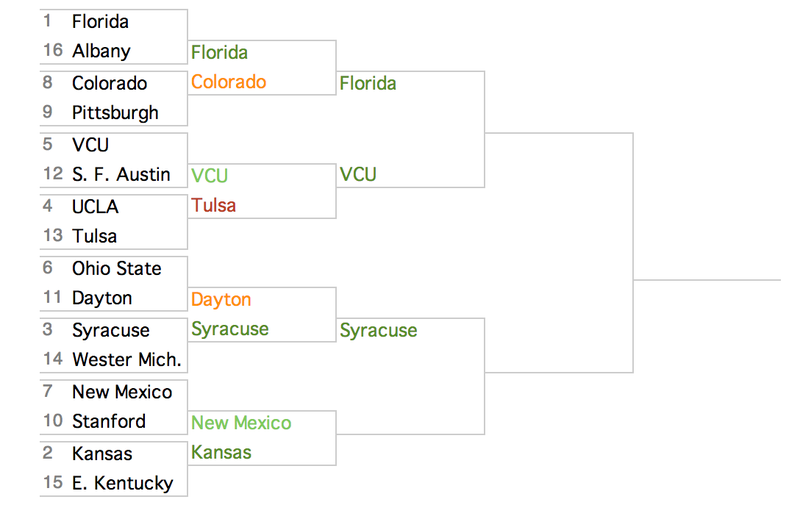 This year, Warren Buffett promised a billion dollars to anyone who picks a perfect bracket. Unfortunately, the odds aren’t in your favor—the chance of picking a perfect bracket if you pick every game at random is one in 9 quintillion (or 9,000,000,000,000,000,000). But that’s just a hypothetical bracket. What are the odds of your bracket? The interactive below lets you figure that out. Using the betting lines for each game and on each team’s chances of the making the Final Four and winning the NCAA Championship, the graphic calculates the odds of every possible NCAA matchup—and every possible NCAA bracket. The graphic also shows how each team affects your bracket’s odds, and which picks lower your chances of winning a billion dollars the most. When Netflix wanted to create a hit TV show, it turned to data. By analyzing its viewers habits, Netflix uncovered that its customers particularly liked Kevin Spacey, director David Fincher, and political thrillers. In part because of these interests, Netflix brought the three together to create House of Cards—and thus far, the results have been tremendous.